Also available in German and Greek. Buy a print of this map with free shipping! To find the geographical location of a place or scene in the list below, simply press on the name and a floating window will appear. 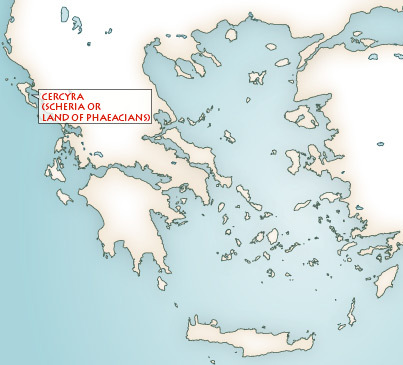 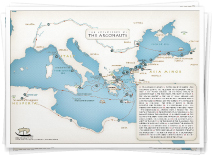 Abdera, Abydus, Acarnania, Achaia, Achelous, Acheron, Acherusian Lake, Aegaleon, Aegean Sea, Aegina, Aenea, Aetolia, Ainos, Alcyon Islands*, Alpheius, Amphissa, Amyclae, Anaphe, Andros, Arcadia, Argolis, Argos, Asopus, Athens, Athos, Attica, Aulis, Axius, Bistonis Lake, Boeotia, Brauron, Calliste (Thera), Calydon, Cameirus, Cape Malea, Caria, Carpathus, Cea, Cephalonia, Cephissus, Cercyra (Scheria or Land of the Phaeacians), Chalcidice, Chalcis, Chios, Chryse, Cicones, Cithaeron, Cnossus, Colones*, Copais, Corinth, Corinthia, Corinthian Gulf, Cos, Cretan Sea, Crete, Crommyon, Cydonia, Cyllene, Cyzicus, Dardanus, Delos (town), Delos (Ortygia island), Delphi, Dikte, Dirphys, Dolionians, Doris, Dulichion, Eion, Eleusis, Elis (town), Elis (region), Enipeus, Ennea Hodoi (Amphipolis), Ephesus, Ephyra, Epidaurus, Epirus, Erymanthus, Euboea, Eurotas, Evenus, Gortys, Hebrus, Helicon, Hellespont, Hermus, Hestiaeotis, Hymettus, Hyria*, Ialysus, Icaria, Ida (Crete), Ida (Troad), Illyria, Imbros, Inachus, Iolcus, Ionia, Ionian Sea, Isthmus, Ithaca, Laconia, Ladon, Lemnos, Lesvos, Leucas, Lictus, Lindus, Livadeia, Locris, Locris, Lycastus, Lycosura, Lydia, Lyrnessus, Macedonia, Maeander, Magnesia, Marathon, Megara, Megaris, Melitaea, Messene, Messenia, Methymna, Miletus (Ionia), Miletus (Crete), Mycenae, Mykonos, Myrina, Mysia, Naupactus, Nauplion, Naxos, Nemea, Nestus, Nisyros, Odomanti*, Oechalia, Oete, Olympia, Olympus, Orchomenus, Oropos, Othrys, Pactolus, Pallene, Pallene, Parnassus, Parnes, Paros, Pedasus, Pelion, Peloponnese, Peneius (Peloponnesse), Peneius (Thessaly), Penteli, Phaestus, Phaleron, Pherae, Phocis, Phthia, Phthiotis, Phylace, Pieria, Pindus, Piraeus, Pisa, Pleuron, Propontis, Pylos, Rhodes, Rhytium, Salamis, Samos, Samothrace, Sardis, Saronic Gulf, Scamander, Scyros, Seriphos, Sicyon, Sigeum, Sipylus*, Sithonia, Sounion, Sparta, Sperchius, Strymon, Stymphalian Lake, Stymphalus, Swamp of Lerna, Syme, Taphos, Taygetus, Tegea, Tenedos, Thasos, Thebe, Thebes, Thespia, Thesprotia, Thessaly, Thrace, Tiryns, Tmolus*, Trachis, Tricca, Troad, Troezen, Troy, Tymphrestus. 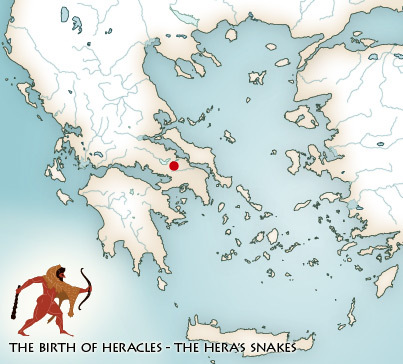 * For the ninth, tenth and eleventh labor please visit the page of Heracles' journeys.